This article will show how to make a simple tracking gauge and how to use it. I made my gauge from 1" and 1/2" box section. Close Up Of The Tracking Gauge In Use. The tracking gauge works by adjusting the bolt on each side (as shown in the close up above) so it just touches the wheel rim at the front, then sliding the gauge backwards until the bolts are next to the rear of the rim and comparing the gap between the bolts and the rim. This method will work if the wheels are toeing out. If they are towing in then start at the rear of the wheels. The gauge has various holes for vehicles of different widths and wheel / tyre diameters. A reasonably flat and level surface. The tools required to adjust the tracking on your vehicle. This method assumes that your rear wheels are tracked correctly and are central to the vehicle. If not the job is more complex and will be described at the end of the article. Centralise the steering rack. You must first make sure that the pivots on the end of the rack (not the track rod ends but the pivots under the gaiters) are equally spaced from the centre line of the vehicle. Do this by turning the steering wheel. How you ensure that the pivots are equally spaced from the centre of the vehicle on yours is up to you to work out. Doing this will ensure that the pivots are in the correct position relative to the suspension pivots and minimise bump steer. Your steering wheel will now probably be not pointing straight. Make it point straight with out moving the steering rack, by either taking it off the splines or taking a universal joint off its splines on the steering shaft / rack pinion etc. Now adjust the tracking by using the gauge and adjusting the track rod ends. Try to get each wheel pointing forward the same amount. ( i.e. you do not want to set the tracking with both wheels steering right or left.) 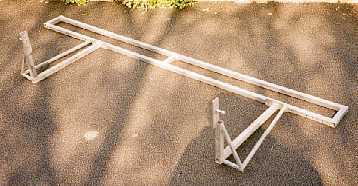 This is easily done by ensuring each track rod is the same length. If the rack does move, you can return the rack to its central position by simply turning the wheel until it is pointing straight. After you have made any adjustment you should roll the vehicle back and forward by at least a car length ( or as much as your garage allows). Now take your vehicle for a test drive and drive it down a straight road and check that your steering wheel is pointing straight. If it is then you are done. If it is not pointing straight then you must adjust both track rods a little amount (whilst retaining the correct toe adjustment). Do not move the steering wheel on its splines as this would mean that the rack pivots are not central. Test drive again and see if the steering wheel is straight. Repeat the adjustment on the track rod ends until the steering wheel is straight on the test drive. Check that your wheel rims are true by spinning the wheel and holding a felt pen / chalk against the rim. Use the tracking gauge on two points which are equal to each other, you do not want to use a part of the rim which has a big dent in it. Check the repeatability of your measurements. Try repeating the tracking measurements to ensure you get the same result each time. If not find out why. If you can not get good repeatability then your measurements are unreliable. The above assumes the suspension pickup points are accurate and the same on each side of the vehicle. Adjust your toe to the manufactures recommended setting. If your rear wheels are out you will have to set the rear tracking from the centre line of the car. Find the centre line of the vehicle and reference from this. 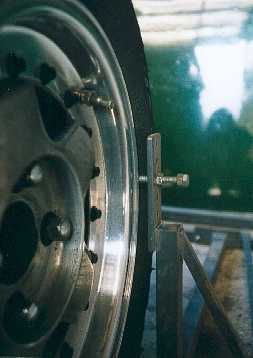 You must ensure that each wheel is the same distance from the centre line and toeing the same amount each side. One method is to construct a rectangle around the car ( in string, straight edges Etc. ) and measure to the wheel rim from this. With this method you do not require a tracking gauge, only a steel rule or vernier. For much more detail on vehicle set up read Tune To Win by Carroll Smith. This details bump steer, advantages of toe in, toe out and what effects various adjustments will effect the vehicle.